This content is brought to you by The Lion Electric Company. The prognosis is clear: we can no longer ignore the impact of heavy-duty vehicle emissions on our health and environment. In fact, 30 percent of greenhouse gas emissions in the United States are related to transportation. That means that switching to zero-emission alternatives should be, more and more, a common-sense decision. Right? Right. Only 4 years ago, it was a major challenge to prove that electrification of heavy-duty vehicles was possible. Today, the discussion revolves around the viability of the business case, total cost of ownership, and the major advantages of going electric, such as noise pollution reduction and technological advancements. Major steps have been taken to make the electric school bus business case a realistic one—but have they been successful? Yes, for multiple reasons. The energy cost savings amount to 60 percent to 80 percent compared to diesel—diesel fuel is often the second highest expense for school bus operators, second only to labor. There are also major maintenance cost reductions, amounting to up to 60 percent in cost reduction. Why? Because there is no exhaust, no DPF, only 20 electric motor parts compared to 2,000 on a diesel engine, no transmission, no oil, and a regenerative braking system that approximately triples the service life of the brakes. Twin Rivers reduced its fuel costs by about 80 percent in California and has demonstrated that Lion electric buses cost 19¢ per mile, compared to diesel buses that cost 82¢ per mile. Picking the right range for your routes, managing electricity cost, maximizing the miles driven, and understanding the funding opportunities readily available in your region will impact your return on investment. Incentives can drastically lower your total cost of ownership. Luckily, there are currently millions of dollars of incentives available that can cover part or the entirety of the initial cost of electric buses to accelerate the adoption of electric school buses all over North America. California has been known to have important subsidies, but other programs such as NYSERDA in New York and the Volkswagen Settlement Beneficiary Mitigation Plan available throughout the entire United States are making it a no brainer for school districts to add electric buses to their fleets. One essential element is that going electric will adapt to your fleet—not the other way around. Electrical infrastructure can be an unknown and stressful factor for many operators. The key is to understand the flexibility you have when picking the right charging infrastructure for your needs. Another possible revenue source for school districts is to leverage vehicle-to-grid (V2G) capabilities. In fact, during peak times, it is possible that utilities could use the energy available in school bus batteries to provide electricity to consumers, back to the grid—remunerating the school for the electricity provided. This technology may also be used for vehicle-to-vehicle (V2V) or for vehicle-to-business (V2B) in case of emergencies or power outages. Overall, the business case for going electric makes sense. 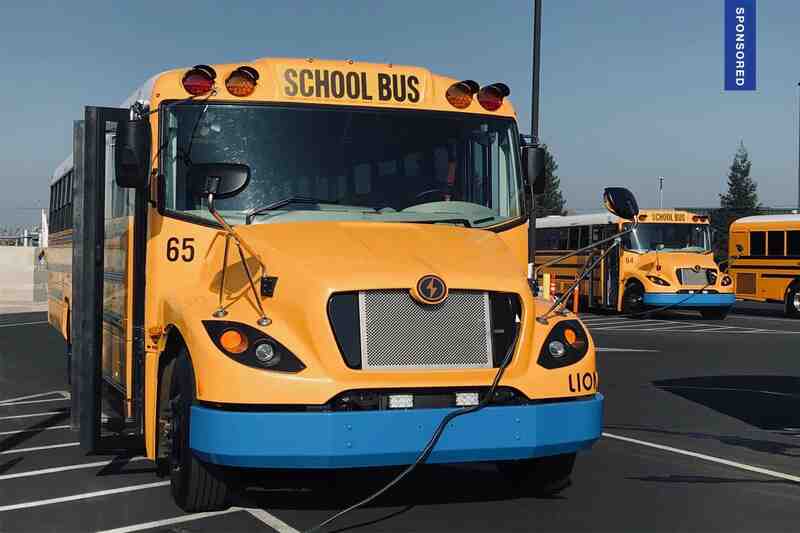 Electric school buses are more affordable than you think and are already on our roads! Learn more about funding opportunities available for zero-emission school buses. Lion is here to assist you with the different funding opportunities available in North America. For all California grants, please email Claire Garcia. For all other grants, please email Marie Bedard. Our grant team will assist you throughout the entire process; from infrastructure and discussions with utilities to assistance with paperwork and filing with funding agencies. Next articleHow Do You Make a Difference?